I have been BAKING a ton of lately. 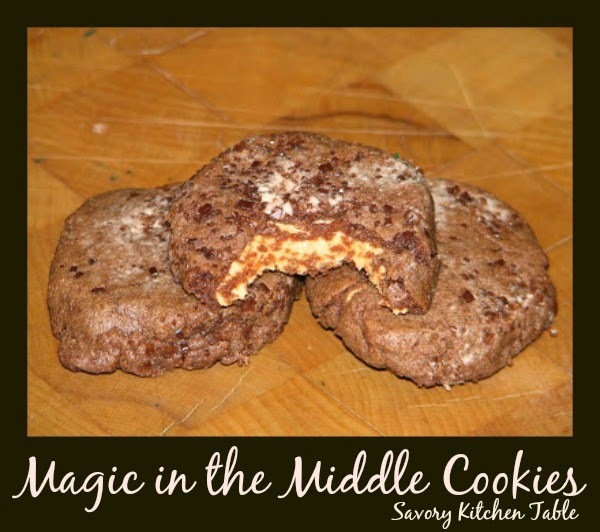 When I stopped by to see Natalie and saw these cookies over at What's for Supper which she had seen over at Recipe Girl I knew they were next on my list to make. Who doesn't love chocolate and peanut butter? It's hubby's favorite combo. I experimented a little with caramels and marshmallows too. Preheat oven to 375°F. Lightly grease (or line with parchment) two baking sheets. Prepare dough: In a medium bowl, whisk together flour, cocoa, baking soda and salt. In another medium bowl, beat together sugars, butter, and peanut butter until light and fluffy. Add vanilla and egg, beating to combine, then stir in dry ingredients, blending well. Prepare filling: In a small bowl, stir together peanut butter and powdered sugar until smooth. With floured hands, roll the filling into 26 one-inch balls. Shape cookies: Break off about 1 Tbsp. of the dough, make an indentation in the center with your finger, and press one of the peanut butter balls into the indentation. Bring the dough up and over the filling, pressing it closed; roll the cookie in the palms of your hand to smooth it out. Repeat with remaining dough and filling. Dip the top of each cookie in granulated sugar and place on prepared baking sheets about 2 inches apart. Grease the bottom of a drinking glass and use it to flatten each cookie to about ½-inch-thick. Bake cookies for 9-11 minutes, until they're set. Remove them from the oven and cool on a rack. *These cookies freeze well. They would travel well too.